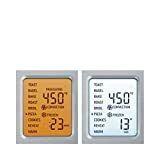 Attribute BOV450XL: Mini Smart Oven BOV650XL: Compact Smart Oven BOV800XL: Smart Oven Dimensions 16x13x9 inches 16.5x15.5x10.25 inches 18.5x16.25x11.25 inches Capacity 11 inch pizza, 4 toast slices 12 inch pizza, 4 toast slices 13 inch pizza, 6 toast slices Element IQ? 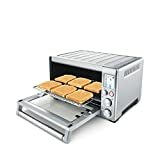 Yes Yes Yes Wattage 1800 1800 1800 Heating Elements 4 (quartz) 4 (quartz) 5 (quartz) Convection No No Yes Pre-set functions 8 8 9 Accessories Baking pan Baking pan, broil rack Baking pan, broil rack, pizza pan Compare Breville's Smart Ovens Why the Breville Smart Oven? Place the oven on a flat, dry surface. Ensure there is a minimum distance of 4" (10cm) of space on both sides of the appliance. 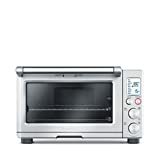 Interested in the Breville BOV800XL Smart Oven 1800-Watt Convection Toaster Oven with Element IQ, Silver? Is the price too high? You can easily price watch this product and we'll notify you when the price reaches your target.